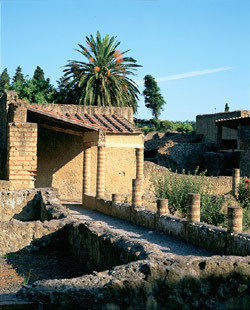 Built during the Augustan period (27 BC-14 AD), the house has a roof terrace looking south towards the sea and supported by vaulted structures, in which they were made paved areas in sectile opus. The excavation was carried out by C. Bonucci (1852) and completed in the thirties by A. Maiuri. Because of its large size (2,150 square meters) and the presence of a thermal plant, it was identified as an hotel. The oldest elements really belong to the spa industry, decorated with frescoes dated to the late 'second style' and white & black mosaic floors.